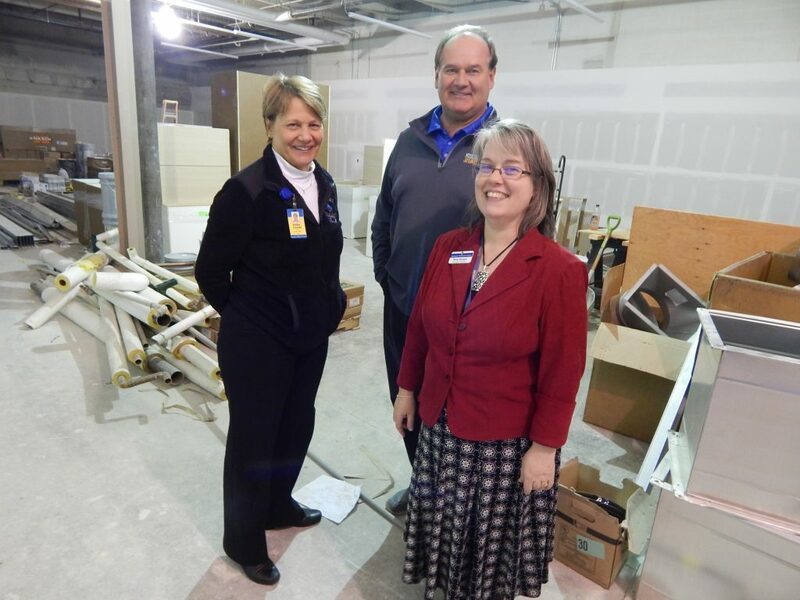 [Left to right] Kelley Conrad, MCC’s vice president for academic affairs; Dan Meyers, director of music at MCC; and Amy Swope, director of the Foundation for MCC, pose during Wednesday’s tour of the incoming Arts and Humanities Center at Muskegon Community College. The public got a glimpse this week of the progress being made on the $9 million Arts and Humanities Center at Muskegon Community College [MCC], which is set to make its debut this fall and which educators and administrators say will significantly expand the school’s arts and music programming, bring much-needed facilities to faculty and students, be accessible to individuals with disabilities, and further grow and support the region’s creative class. The Arts and Humanities Center project includes renovating the college’s former Applied Technology building and moving its visual arts and music programs into the newly refurbished space. 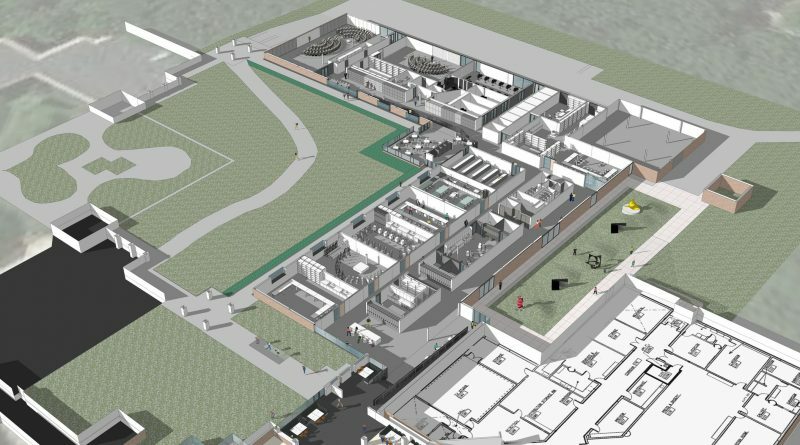 As part of the project, the college’s automotive program will move from the former Applied Technology building into a renovated area that previously housed sheet metal union classrooms. Construction is expected to wrap up this spring, and educators, students and the public will be able to use the center when it opens for the fall 2019 semester. 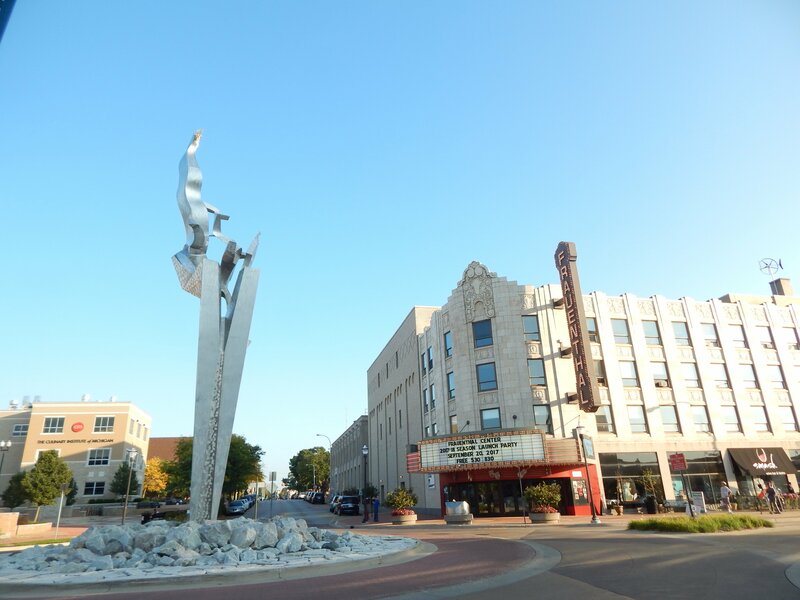 About half of the $9 million project is being paid for through a millage approved by Muskegon voters in November 2013, and the other half is being paid for through fundraising, state and federal grants, and student and tuition fees. The Arts and Humanities Center is one of four projects that were part of the $24 million millage: the three other completed projects include the $14.81 million Sturrus Center in downtown Muskegon, the $9.6 million Science Center, and the $14.1 million Health and Wellness Center. A total of $50 million has been spent on the four projects, which includes the millage and additional fundraising and grants. Both the art and music departments have long faced significant needs in the current spaces from which they’ll soon depart, Nesbary and college educators emphasized. In 1975, the art department moved to what was then described as a temporary venue just north of the college’s main building—in 2019, the department is still there. The current art department’s space is “old, small and cramped,” Nesbary said. “It was not appropriate for delivering a college curriculum, and it was not appropriate for professional artists to use to exhibit their work and help mentor students, not appropriate at all,” the college president said. Kelley Conrad, MCC’s vice president for academic affairs, noted that the music department too is dealing with sub-par conditions in the main building’s lower corridor. The new Arts and Humanities Center will include a music ensemble room, a keyboard lab, music teaching suites, practice rooms, a music library, a student lounge, a kiln room, a woodshop, an art lecture room, a faculty studio, and studios for 3D art, painting, advanced drawing, printmaking, and ceramics. Additionally, improvements will be made to the Frauenthal Foundation Art Center’s Overbrook Theater and control room. As part of this project, $1 million is being spent on renovations to MCC’s automotive building, including increased doors and bays available for auto technology instruction space, a student break area, instructor offices, and a classroom. The college too is continuing to raise money for further work at the new Arts and Humanities Center and aims to raise about $1.5 million more for renovations at the Overbrook Theater, a large ensemble room, and classroom space, Director of the Foundation for MCC Amy Swope said. Those interested in donating or learning more should contact Swope by calling (231) 777-0571 or emailing Amy.Swope@muskegoncc.edu. “We’re going from 0 to 90; there’s no comparison between the two,” Tim Norris, an art instructor at MCC for the past 22 years, said, referring to the old and new arts buildings. The new space will be a huge morale boost for educators and students alike, Norris said. In addition to the aforementioned cramped spaces and inadequate equipment, the current arts space is cold in the winter and hot in the summer, Norris explained. Many of the administrators and educators we spoke to Wednesday noted the new center will be a major draw for students. With the new building, however, educators and administrators say there will be that initial wow factor and expanded programming that will help to draw students and further establish Muskegon Community College as a cultural hub in the region. Plus, it will help to support—and grow—the region’s growing creative landscape that now includes such institutions as the Muskegon Museum of Art, the Blue Lake Fine Arts Camp—the largest summer arts program in the country, the Frauenthal Center, the West Michigan Symphony Orchestra, the Shoreline Symphony Community Orchestra, The Block, the Muskegon Civic Theatre, the Red Lotus Center for the Arts, the Lakeshore Art Festival, and more. MCC Board of Trustees Chairperson Diana Osborn noted the role the college continues to play in the region’s evolving creative class. As more artists and musicians are priced out of other Michigan cities with soaring real estate prices, such as Grand Rapids and Ann Arbor, the Muskegon Lakeshore area could be poised to become home to these individuals—who officials note would benefit from being able to access cultural activities at MCC.